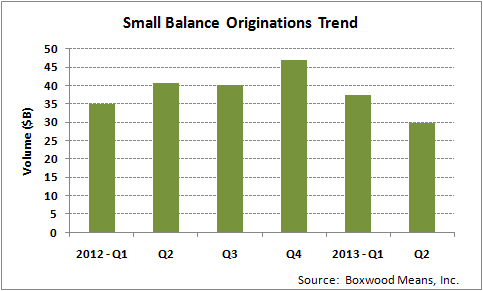 SmallBalance.com parent Boxwood Means' small-balance commercial mortgage originations research points to a hefty drop in new loan closings during the second quarter - compared to both this year's first quarter and the year-earlier period. What the hard data doesn't necessarily reveal is why the quarter's aggregate fundings of $5 million-and-under mortgages, totalling a bit under $30 billion, were off 21 percent from the previous three months - and 27 percent behind Q2 in 2012. It's tempting to simply point out the steady second-quarter rise in the fixed-rate mortgage market's benchmark index - the 10-year Treasury yield - which jumped a full percentage point (to the 2.6 percent vicinity) between early-May and early-July. After all it's logical to think property owners who considered refinancing when rates fell to exceptional troughs in March and April, reconsidered during that pretty dramatic subsequent T-note hike. Likewise investors seeking financing for small-cap property purchases presumably slowed dealmaking somewhat as they pursued pricing adjustments from sellers to compensate for the diminished going-in cash flows. However anecdotal evidence from some loan originators doesn't really jibe with that explanation. Indeed executives overseeing these operations are a bit at a loss to explain the substantial decline in activity that had been humming along reasonably as the banking environment (and in turn small-balance liquidity) has continued to improve. Even more perplexing is the fact that the Mortgage Bankers Association reported that overall commercial mortgage debt originations rose 36 percent over the year-earlier period, and 7 percent over Q1. One might expect that any rate-driven slowdown in originations would more likely show up in Q3 figures – given the lag between rate-locks and closings. Veteran small-balance lending pro Keith Van Arsdale, president/CEO of multi-market originator BMC Capital, says he didn't perceive any noteworthy "pause" in refinance activity until the 10-year T yield approached 3 percent in the first week of September - as the marketplace anticipated the Federal Reserve's so-called tapering of its rate-limiting bond-buying activities. But interest in refinancing has since picked up notably as the benchmark yield headed back toward 2.6 percent after the Fed indicated its quantitative easing program would continue at least into 2014 (the Oct. 4 closing rate was 2.645 percent). BMC’s purchase-related lending slowed somewhat as rates spiked and sellers generally refused to budge on pricing – but not nearly as dramatically as Boxwood Means' overall small-balance figures suggest, Van Arsdale continues, adding that "his firm's year-to-date originations [through September] up by double-figures over the comparable 2012 period." That being said, despite seasonality contributing to slower loan growth in July and August for his firm, Van Arsdale indicated that "treasuries increased during this time period as well, so I cannot help but think the rate increases had an impact, too." At Business Partners LLC, which originates and syndicates mostly small-balance commercial mortgages on behalf of credit unions, the rising T yield during the quarter actually pushed borrowers to close quickly, notes chief lending officer Gary Bechtel. "We just didn't see a downturn in deal flow" during the second or third quarters, he relates. Borrowers facing maturities over the coming year just don’t have the luxury of a lot of "rate-shopping" even amid today's suddenly more volatile environment, he adds. Bechtel does echo Van Arsdale's concern that further hikes in debt costs may well prompt buyers to take harder lines on capitalization rate-based valuations – potentially slowing originations. But at least for the time being, typical spreads between cap rates and debt rates on many small-cap properties – even apartments in a lot of cases – still allow for considerable "positive arbitrage" for buyers, Van Arsdale stresses. And like many peers, Bechtel anticipates that rates are bound to move up gradually from today's historic lows assuming the economy continues crawling its way back to health in coming years. But also channeling Van Arsdale, Bechtel nevertheless has little concern about BP's future transaction pipeline – given the many hundred of billions worth of commercial mortgages scheduled to mature over the coming three or four years. A lot of credit unions around the country have become quite comfortable lending against a variety of commercial properties – whether individually or through the syndications BP arranges. Likewise Van Arsdale is seeing strong signs that banks are increasingly interested in competing for commercial real estate lending opportunities. As the admittedly frustrating pace of recovery inches supply-demand fundamentals back toward equilibrium amid the artificially low-rate environment, risk-adjusted returns of income-property lending are becoming more and more attractive to the commercial banking community, he elaborates. "Banks are getting hungrier to do deals," Van Arsdale observes. "I think we’ll see them continue to jump in." SmallBalance.com's MarketBeat also crunched some of the Small Business Administration's approvals and rate data to gauge the possibility that the Treasury yield hike is cutting into the agency’s loan guarantee activities. And lo and behold, SBA's loan volume for two primary property-secured loan guarantee programs did decline during second quarter. SBA loan production slowed from first quarter to second quarter in each of the last two years. However, the rate of deceleration increased during second quarter of this year: SBA 7 (a) volume plummeted 48.0% compared with a second-quarter 2012 decline of 40.2%; likewise, 504 approvals decreased by 51.1% this past second quarter versus a drop of 36.1% in the corresponding period last year. Year over year, the trend in SBA volume is more mixed. SBA 7 (a) loan approvals increased 5.8% through June of this year compared with a year ago, but 504 loans fell considerably, by 28.8%. Whether the relationship between the drop in business loan approvals and interest rate increases is correlative rather than causative, is still unclear. The publicly guaranteed tranches of the SBA 504 loan program, which are generally pooled and securitized into debentures, have jumped with the rise in Treasury yields. After hitting year-to-date lows of 3.61 and 4.15 percent for loans effective in May, average 10-year and 20-year loan rates had risen to 4.86 and 5.70 percent in September. The longer-term rate moved up more dramatically: rising nearly 40 basis points in June and another 70 in July before briefly stabilizing, then jumping 45-ish points in September. Meanwhile, 504 and 7 (a) loan volume bounced back in third quarter by 14.3% and 7.9%, respectively. So as anecdotal evidence runs somewhat counter to statistics emanating from SBA and Boxwood Means for the April through June period, the jury remains out for the time being on the impact of interest rate increases. Boxwood's third quarter originations research may shed a bit more light on the topic when published towards the end of this year.